Schools can now apply for funding through the new School Safety and Security Grant Program. Awards of at least $25,000 can be utilized to help schools create safety programs, hire and train personnel or purchase security equipment to help provide a safer learning environment for students. A total of $52.5 million will be distributed. The program is open to all Pennsylvania school districts, intermediate units, area vocational-technical schools, charter schools and private residential rehabilitative institutions. It was created as part of a comprehensive school safety bill that was signed into law in June. Schools must submit an application no later than October 12, 2018. Additional details are available at: https://www.pccdegrants.pa.gov/Egrants/Public/OpenAnnouncements.aspx. School safety was also the focus of a recent episode of WBRE’s “Newsmakers.” Here is the link to watch the show. 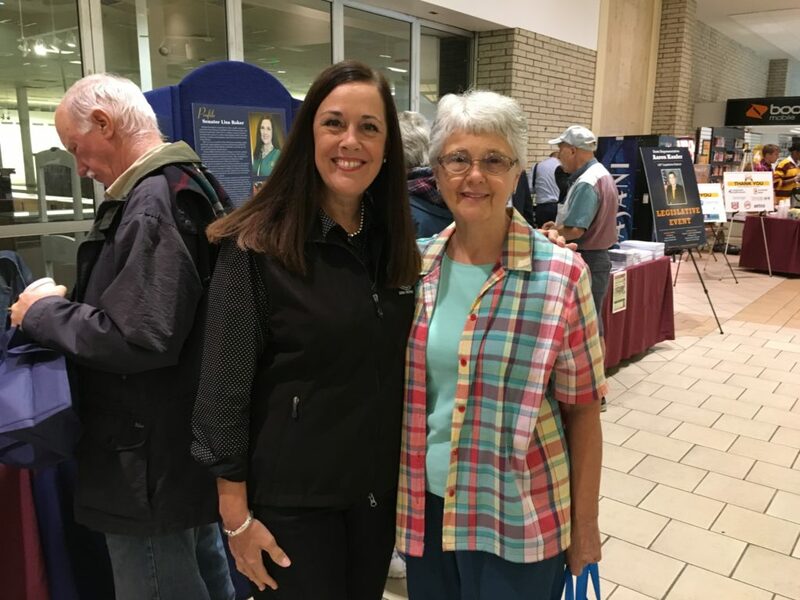 I recently joined Sen. John Yudichak and Reps. Aaron Kaufer and Jerry Mullery to host the Luzerne County Senior Expo at the Wyoming Valley Mall in Wilkes-Barre. Hundreds of visitors received information from the many businesses, organizations, government agencies and other groups serving seniors that were represented at the event. Flu shots, blood pressure checks and other health screenings were also available. People talked to me about property tax relief, prescriptions, and programs to help them age in place at home. I also heard a lot about how the opioid epidemic is straining families and putting grandparents in the difficult position of having to raise their grandchildren. It is helpful to hear the personal stories as we continue working to address these issues. 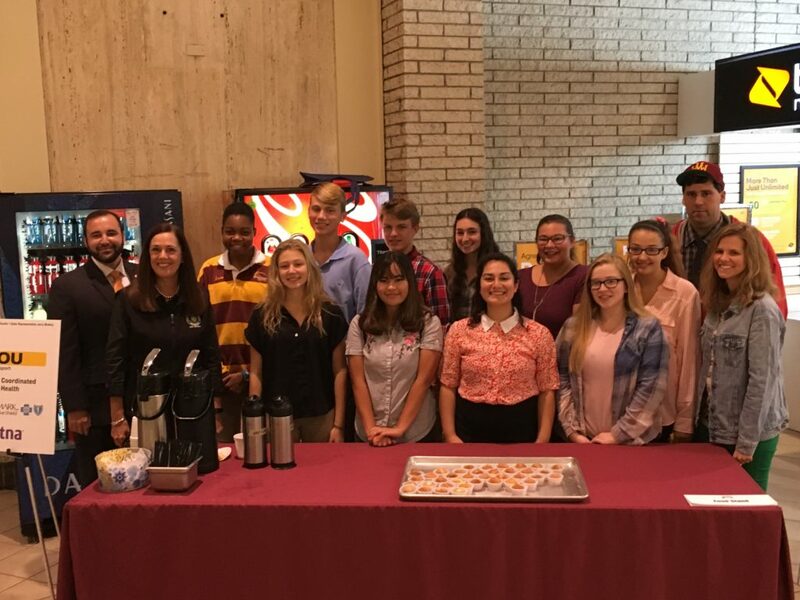 It was also nice to have students from Wyoming Valley West High School on hand to assist by handing out tote bags, and operating the complimentary refreshment table. Joining Steve Ross and Ryan Hogan from Luzerne-Wyoming County Drug and Alcohol Program and Mike Donahue from Wyoming County Human Services for Recovery Advocacy Day at the Capitol. The Substance Abuse and Mental Health Services Administration recognizes September as National Recovery Month. 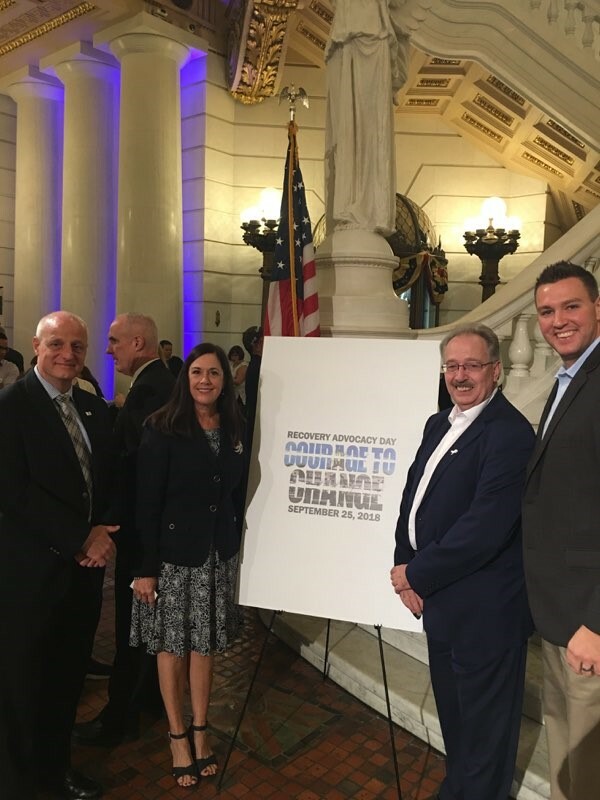 I joined the Pennsylvania Association of County Drug and Alcohol Administrators for the Pennsylvania’s Fourth Annual Recovery Advocacy Day to draw attention to critical prevention, treatment and recovery support services. My father was a founding member of Wyoming Valley Drug and Alcohol Services, so my involvement in this issue is quite personal. He was a strong advocate for getting people treatment and helping them find their way. Considerable strides continue to be made in our communities where task forces and individuals are working together to give those in recovery a fresh chance at a productive life. Individuals seeking recovery resources for themselves or a loved one can visit https://apps.ddap.pa.gov/gethelpnow/#_blank or call the toll-free PA Get Help Now helpline at 1-800-662-HELP (4357). A live chat option is also available online or via text message at 717-216-0905 for those not comfortable speaking to a helpline operator. The Senate Veterans Affairs and Emergency Preparedness Committee and Senate Appropriations Subcommittee on Health & Human Services held a Joint Hearing on Veterans Homes and Living Independently for the Elderly – or LIFE – Program. Testimony was heard from the PA Department of Military and Veterans Affairs’ Bureau of Veterans Affairs, which operates Pennsylvania’s six Veterans Homes, and two LIFE Programs, which is run through the Medical Assistance Program and provides a comprehensive array of health and support services to qualified seniors who face health challenges that threaten their continued ability to live independently in the community. Have your septic system inspected annually. By having your septic system inspected annually you are much less likely to experience major problems with your system. Similar to car maintenance, it is more cost effective to take preventative actions rather than waiting for something to go wrong. Unnoticed little problems become big, expensive problems. Consult a wastewater professional to inspect your septic system. The Department of Environmental Protection (DEP) requires septic systems to be pumped at a minimum of every 3 to 5 years. Some systems must be pumped more frequently depending on the size of the tank, as well as the amount of people within the household. Septic systems work because waste is absorbed and broken down biologically. A toilet is not a trash can. Disposable diapers and wipes, feminine hygiene products, coffee grounds, cigarette butts, and cat litter can and will damage a septic system. It’s not just in the bathroom. What goes down the drain has a huge impact on your septic system. Fats, grease, and solids can clog a system’s pipes and drainfield. Cleaning products such as bleaches, detergents, and drain cleaners are fine to use occasionally but when used excessively they can kill the natural bacteria within your septic system. Do not use excessive amounts of water. Using excessive amounts of water can overload a septic system. Use water efficiently and stagger use of water-based appliances to prevent an overload. According to the EPA, there is no scientific evidence that biological and chemical additives aid or accelerate decomposition in septic tanks. Some additives can be detrimental to the septic system and sometimes can contaminate ground water. Tree roots grow rapidly and can quickly cause damage to your septic system. Roots will seek out your nutrient rich drainfield and can possibly find their way into the septic system’s pipes. Trees are beautiful. Broken septic pipes are not. Drainfields naturally absorbs waste. Driving a truck over it or letting cattle graze on it compresses the soil and cause damage over time. Grass is nice but maybe a Pollinator Garden would be even better. A soggy drainfield can have problems aborting effluent waste from the septic tank. Do not pump the septic tank during a flood or saturated drainfield conditions. Pumping it out then could cause the tank to try to float out of the ground and may damage the inlet and outlet pipes. The best solution is to plug all drains in the basement and drastically reduce water use. After flooding conditions subside, pump the septic system as soon as possible. Be sure to pump both the tank and lift station to remove silt and debris that may have washed into the system. Lastly, examine all electrical connections for damage before restoring electricity. To keep your septic system from freezing in extreme weather, it is crucial to keep the tank and drainfield warm. Heat is naturally produced during the biological process of waste breaking down in the tank. Snow cover will act as a blanket and your septic system should be insulated. If there is no snow, an alternative steps is to layer 8-12 inches of mulch, hay, leaves, or any loose material that will stay in place and not become compacted over the tank and drainfield. If your septic system does freeze, call a septic system professional. This is not when you hire “Joe Back Hoe.” A septic system needs professional maintenance to prolong its life and the continued value of your property.